I must ask: did you enjoy chemistry or electronics kits as a leveret? (Or your species' equivalent =:) Any fond memories? Steam Powered Giraffe will be playing live again on YouTube, entirely gratis, on Saturday, April 1, at 1pm PDT/9pm BST. I'll be trying this service out presently: 33Mail. They give you unlimited email aliases, which can be independently zapped; so, you might enter a competition or sign up for some newsletter, and if it turns out they begin spamming you or selling your address, you can then just kill that alias, leaving everything else unaffected. You don't even need to set anything up - just use whatever alias you want, and if anything's sent to that address, it'll automagically be set up and forwarded to your real address. The basic service is free, with a small 10MB monthly bandwidth limit; "premium" for $1/mo raises that to 50MB, permits anonymous replies, no ads, and use of your own domain (with the basic level, your email addresses will be somerandomname@yourusername.33mail.com). There's also a "pro" level at $5/mo, giving 500MB/mo and use of five custom domains. 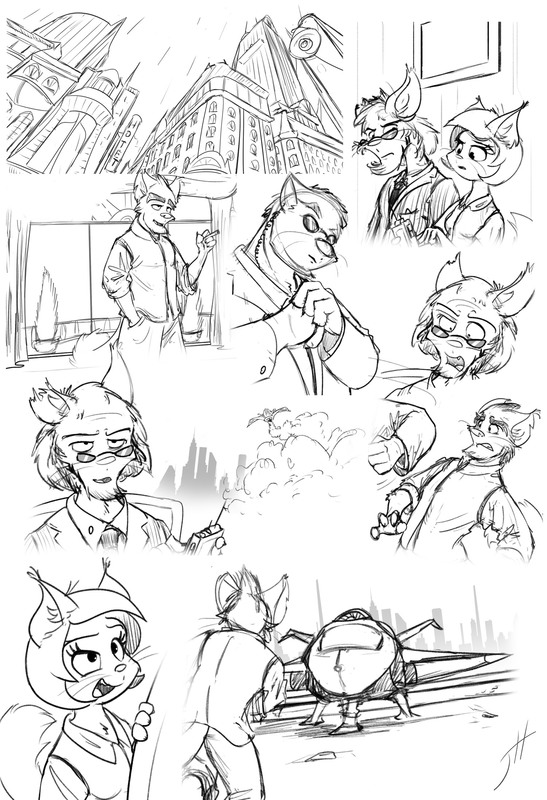 Here: some sketches from /u/fxscreamer's graphic novel, a work in progress. The Royal Mint has a site dedicated to the new £1 coin, brought into circulation on Mar 28 2017, noting the rationale behind its creation, how it differs from the existing coin, and so on. They note that currently, about 1 in 30 £1 coins is counterfeit. 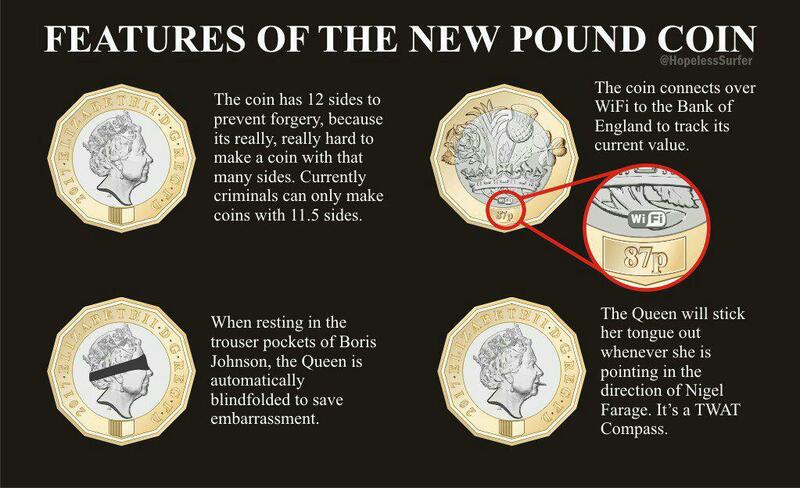 The Mint has a guide on telltale signs - often, fakes are fairly easy to spot, if you're looking to begin with, but who really notices much about pound coins in change, beyond their number? One that gives away a lot is simply that the faces on genuine coins are always aligned; beyond that, it gets down to quality, with the lettering around the edge often being rather ropey. On which note - did you know that we're still uncertain as to where Earth's gold originated? There's a popular theory that it's the result of supernovae, but, that has certain factors against the current understanding, including the amount and distribution of such heavier elements. It may, in fact, be the work of neutron star collisions - or, indeed, a combination of the two. And lovely sketch work, thanks for pass that on too. As a pup, I did indeed do chemistry kits and electronic kits. I failed to blow up the planet or electrocute my self, so the dangers of those being taken off the store shelves was all mythical. 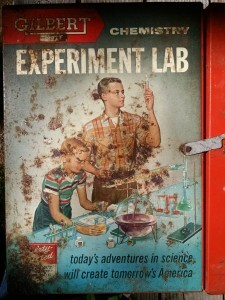 I was always fond of the "snowglobe" experiment, producing that renowned precipitate. I'd love to see what kind of chemistry kits are available now - ISTR the ones the Science Museum sold were quite good, but expensive, coming in at the £70-100 mark for ones with any real number of compounds. They note that currently, about 1 in 30 £1 coins is counterfeit. If that's true, that's pretty hilarious! Unfortunately none of the coins I have on hand appear to be counterfeit according to their guide. It's a .dot file, FWIW. I don't suppose that's a Graphviz file...? it seems if you frequent certain markets or streets, there'll be people openly selling them - one comment on Hacker News mentioned, I believe, £40 per 100 for ones that wouldn't work in machines, or £80 per 100 that would. Haha, nice. BTW, have you seen this explanation of all the new features? A very digestible quantity of lovely info as ever, my friend! I will further promote your ad link as well ^v^ .... and yep, some limited access to Chem and Elec sets thru friends and school ... I don't think we had very elaborate kits of our own at home. For sure cyber security is an interesting field. Also finding all the backdoor crap that people leave hanging around in Windows and other packages, for example. I would love to get more engaged there except that there are people who can already do a much better job (and who have much greater patience) than myself. My brother and I in our little basement lab, around 1963/64. I'm the spooky Shane kid ;o) I never did anything memorable with the set. My brother was more the electrical wizard- he built several (tens) of those Heathkit items, including amps and even a five-band radio. Had he survived his wild teen years he would have been right at home with all things computer. 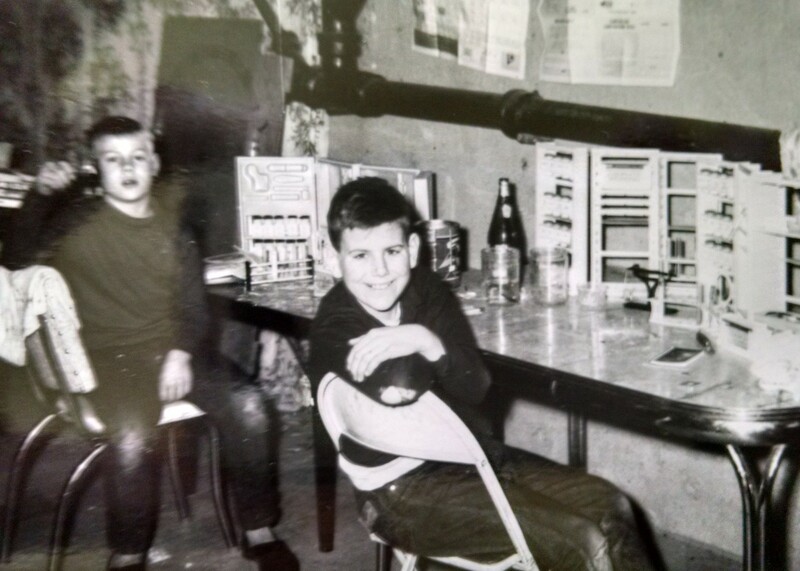 I found this in my parents' barn this past summer, and think it is the one with my brother in the above picture. It still has various nasty and unlabelled chemicals in it :D I also found my kit but alas, it was only an empty metal box. 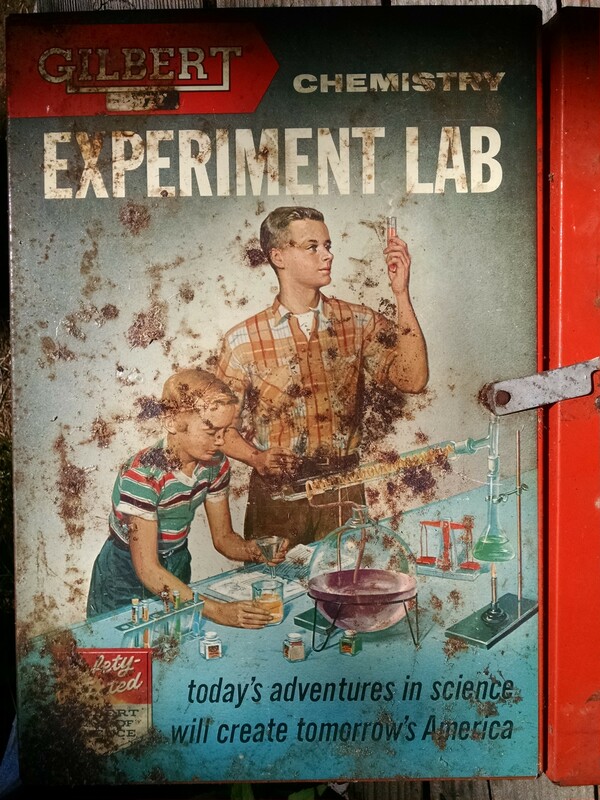 Should I also mention that my brother's experimentation led him to trying to concoct gunpowder? All we got from the ingredients assembled was a flare powder. Still exciting! As a kid I mostly used the powder to add realism to pushing a model car off an embankment after lighting a fuse... you know, a Charles Addams type of outlook on things. My brother's friend went the full route and somehow got hold of some TNT and blasting caps. That was... educational. The cider was pretty simple. A gallon of cider, a cup of sugar, a cup of raisins, and it was put under the shed until it got bubbly. Luckily I never got poisoned. The still was my brother's idea to make the cider into something of higher octane. Fun with science!